Planning ahead for an artistic New Year? Look no further! sfclayworks has a variety of options that might fit your needs. 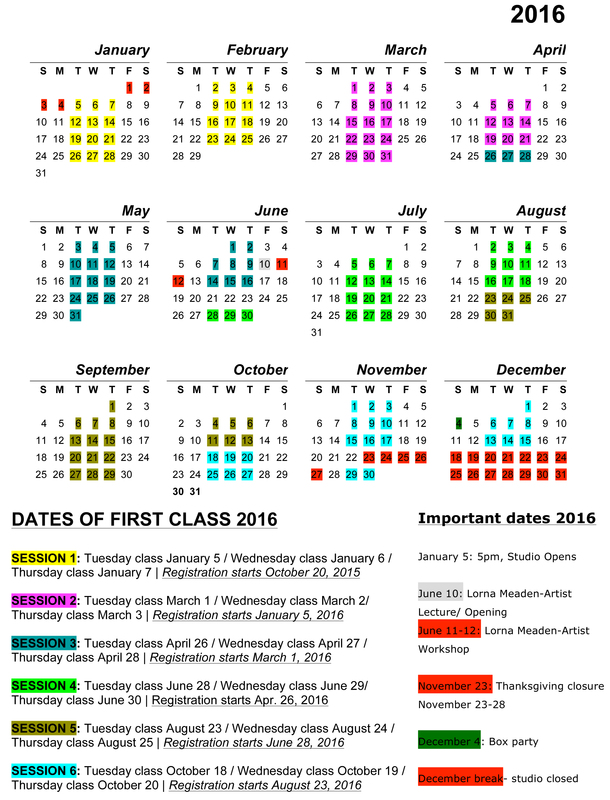 Please check out our calendar of classes for 2016. We have also listed below the start dates of each class for the six-eight week sessions we hold at sfclayworks. Hope to see you in 2016! Update: We are no longer accepting applications for Session 6. We begin accepting applications for Session 1 of 2017 on October 18, 2016. Eight week class fee is $290; community membership is $165 per month. For more information about our future classes, please take a look at this calendar and our Classes page. Thank you for your interest in sfclayworks. Session 1-eight week class sessions begin on the following days. Tuesday class-January, 10, 2017; Wednesday class-January 11, 2017; Thursday class-January 12, 2017.